The mixtape was an analog prototype of today’s social media. Make your own throwback image at www.says-it.com/cassette/. David Byrne (he of Talking Heads fame, for the uninitiated — and he’s still got it) dedicates two early chapters of his ambitious book How Music Works to exploring the long, fruitful interplay between technology and sound. But whereas most treatments of this idea seem to focus only on how technology has left its mark on music (for good and ill), Byrne deftly demonstrates how these transformative forces work in both directions: Music, too, has shaped technology. The mixtape as psychiatrist? Perhaps that’s a bit much. The mixtape as friend? Sure, in a way. The mixtape as solace? For many music lovers of a certain age, absolutely. And it could be much more. With the introduction and mass production of cassette players featuring a recording function (and later, crucially, models with dual tape decks), music lovers everywhere were transformed from passive consumers to amateur producers. The ability to make mixtapes rapidly caught on and developed into a highly personal art form all its own. From the early ’80s to the aughts — pre-iPod and all that — think of all the time people spent making mixtapes and their more sophisticated descendants, mix CDs. Mixes for themselves, for friends, for road trips, for parties, for infatuations. The process was a tad more tedious than clicking and dragging. Enormous amounts of productivity must have been lost! (This might be our first clue that they were a form of proto–social media.) But since everything has its tradeoffs, much was gained too. On a smaller scale defined by the limitations of available technology at the time, mixtapes existed and functioned similarly to how today’s social media services do, and not merely in the same very general way books and pamphlets and even language itself can be thought of like that — i.e., as technologies that advance the spread of information among people. That’s because while very few people had their own printing press (well, until the internet), tape recorders and boom boxes fast became a common sight. Their very commonness gave them a uniquely egalitarian touch, a quality that also defines today’s social media and explains its appeal. And while mixtapes and social media each granted individuals newly widespread access to innovative technologies, that isn’t their only commonality. The act of carefully compiling a mix was usually a private affair, but the goals of these solitary efforts were often expressly social. The makers of mixtapes and mix CDs used their creations to connect to others, to share new material, to curate information, and to present to the world a meticulously crafted version of themselves. As Byrne writes, “Other people’s music — ordered and collected in infinitely imaginative ways — became a new form of expression.” Mixtapes afforded the opportunity to display cultivated musical and cultural tastes; a stylish awareness of obscure non-mainstream gems and therefore a jealously guarded individualism; sensitive production values in the making of the mixes themselves; and, for the more dedicated practitioners, sometimes even design skills (through elaborate illustration or hand-lettering). Admittedly, not all mixtapes were for sharing. Many served merely as convenient libraries of the compiler’s favorite songs, perhaps assembled by artist, genre, or mood, obviating the annoying need to switch cassettes in a tape deck or wait for certain songs to come on the radio. Still, after being carefully curated, mixtapes often were designed to be shared. Each one held the potential to be both an artifact and a performance. That’s why these physical objects were precursors to the online items and deliberately constructed digital personae people have learned to present to the world in the past decade. It’s also worth mentioning that just as with social media, early adopters tended to be young people. Mixtapes and mix CDs aren’t entirely dead, of course. But even if this subtle, highly personal art form is still physically being practiced somewhere out there, it’s certainly diminishing and will continue to do so. One day it will be gone. The operative word above is “physically.” There are ways to accomplish essentially the same act 100% digitally. But somehow it doesn’t quite seem the same, does it? It’s like comparing an email to a handwritten letter — as convenience is gained, something personal and irreducible is lost. Imagine some smitten kid preparing a mix today for the object of his affections. Would the bold suitor be aware of blank CDs’ existence (he could this very minute get a stack of a bazillion from his local Rite Aid, but who knows for how much longer)? And would he have access to an appropriate — that is to say, antiquated — recording device even if so? MacBook Airs don’t have internal CD ROM drives. It’s probably more likely that he’d just click and drag his way to creating a super-smooth Spotify playlist and ... email it. Upon receiving such an email, how much would the recipient value the content itself? “A good mixtape to put you in the right mood.” That’s a lyric from an old Beastie Boys song I must have heard a hundred times in my misspent youth. 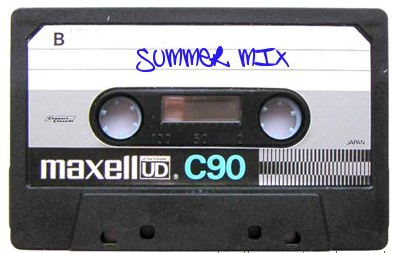 In my head, before fact-checking it (bless the internet), I’d always heard the words slightly differently: “a good mixtape can put you in the right mood.” It’s a sentiment that still rings true. Count yourself lucky if you were around to understand why.